The East Bay city of Pittsburg is considering a new oil terminal, which would supply crude to Bay Area refineries. Some residents are hoping to stop the plan in its tracks. The terminal would bring in oil via ship, pipeline and railroad. At maximum capacity, it could handle 375,000 barrels of crude a day. Local residents are concerned about the effects it would have on air and water quality, and — in light of a number of recent accidents outside California — the safety of transporting crude oil by rail. At a rally on Saturday, about 150 people gathered to protest the project, proposed by an Irvine-based energy company called WesPac. 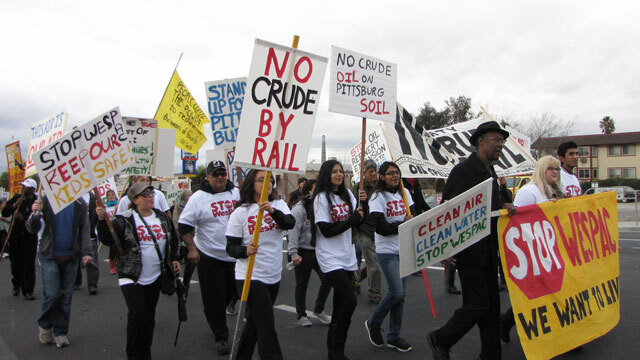 "We got kids, we got grandkids, nieces and nephews and young people like myself who grew up here all our lives," said Quincy Kaisa, president of the Pittsburg Ethics Council, a group formed to fight the oil terminal. "We hope to better the future of Pittsburg, but we can't do that if WesPac is polluting our air and our water supply." WesPac is proposing to re-open a marine terminal and oil storage facility that used to belong to PG&E. The company's plan is to update the existing infrastructure and to build a new rail terminal nearby, on property that would be leased from BNSF Railway Company. "Our project is going to be completely silent and odorless and the safest facility in the country for this type of business," said WesPac project manager Art Diefenbach. "And it's consistent with the types of operations that are going on in that area already." Refineries here in the Bay Area have traditionally taken in crude via pipeline, from Southern California, or by ship, from Alaska or overseas. But California's oil fields are producing less, while there's a boom in the central part of the country, in places like North Dakota's Bakken formation. Oil companies are eager to get access to the lower-cost crude, and the way to get that crude oil to refineries on the West Coast is by rail. Valero, in Benicia, is looking to build its own rail facility, and there are other projects in the table in California. But after a series of derailments and explosions, transporting crude oil by rail — especially from the Bakken Shale in North Dakota — is coming under closer scrutiny. Federal agencies are investigating the risks of transporting Bakken crude by rail. And Governor Jerry Brown proposed boosting the funding for California's oil spill response program in his budget proposal, citing the expected increase of oil shipments by rail. The city of Pittsburg is preparing an environmental impact report on the WesPac project. That's expected to be completed sometime this month, after which the planning department and city council will decide whether it can go forward.